A golf glove should fit comfortably and snugly. Wearing a golf glove during a game of golf is not absolutely imperative. 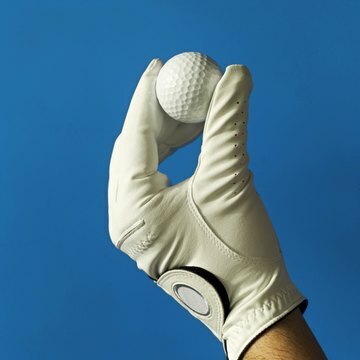 But if you haven't worn a glove during previous rounds, wearing one can give you an improved grip on your clubs. Golf gloves are produced by a number of leading golf manufacturers and are often made of leather, though synthetic varieties also exist. They vary significantly in price according to their quality and features. Determine the approximate size of your hand by estimating whether it falls under the small, cadet, medium, large or extra large category. If you have used a golf glove in the past, check its tag to confirm the size. The hand you measure should be the top hand in your golf grip, for instance, the left hand if you are a right-handed player. Try on a number of golf gloves until you find one that fits correctly. For the glove to fit, it should be snug but not overly tight. Your fingertips should press lightly against the tips of the glove and band around the wrist should not cut off your circulation or prevent mobility. Move your fingers while wearing the glove to check the mobility offered by the glove. The glove will loosen through use, but avoid gloves that are overly stiff. Check the palm of the glove, particularly in the area around the heel of your hand. This area is often one of the first to fail on a golf glove, so many manufacturers sew an extra layer of leather padding in this area. Note added features and accents of the glove such as whether it has a detachable ball marker domed to it. Browse different brands and look at their styles. If you favor one brand, see how its glove fits your hand. Most gloves are white, but there are other colors available, and some gloves have subtle color accents, depending on your taste and sense of style. Golf.com: Can $20 Buy You a Better Swing? What are the Different Golf Glove Sizes?